Sometimes, Broadway producers decide they need to turn a long forgotten movie into a musical. To do so, they usually rope in talented composers and lyricists to cobble together some songs. And to really seal the deal, they hire someone famous (anyone famous, it seems) to entice ticket buyers and make theatergoers wonder: can so-and-so really pull it off? 1) The storyline is perfect for a madcap musical. 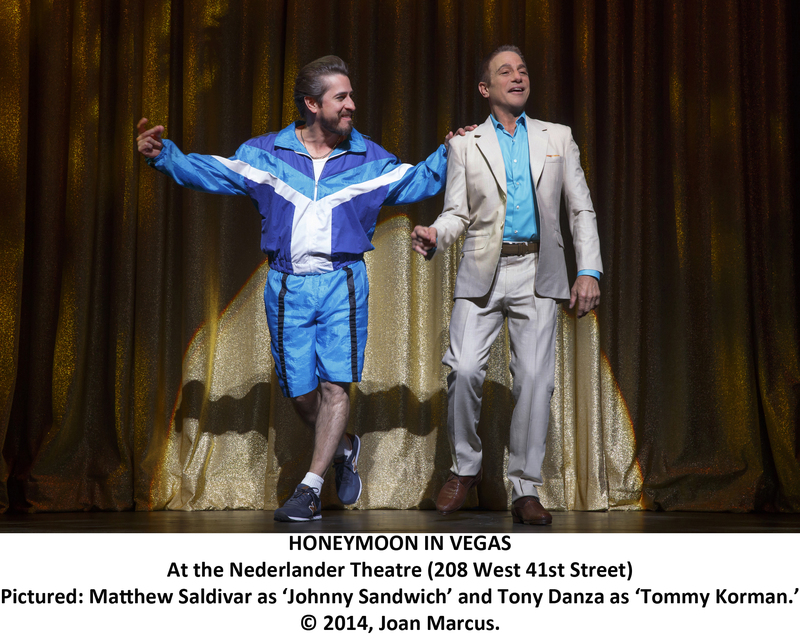 Honeymoon in Vegas begins with a silly premise: that Jack (Rob McClure) can’t marry his long-suffering girlfriend Betsy (Brynn O’Malley) because his mother (Nancy Opel) cursed him on her death bed. When Betsy confesses that she isn’t sure if she can stay in the relationship without commitment (“Anywhere But Here”), Jack decides that they’ll elope in Vegas. But when high-rolling gambler Tommy (Tony Danza) sees that Betsy looks just like his deceased wife, he’ll do anything to break up the engagement. Yes, this is the plot of the show. It relies on weird coincidences, family curses, and some good old-fashioned sexism. (No, Tony Danza, “stealing” a woman from another man like a prize farm animal is bad, and you should feel bad.) But those ridiculous elements make up an excellent farce that would have Moliere laughing in his powdered wig. Not only does Honeymoon in Vegas (with a book by Andrew Bergman and direction by Gary Griffin) have impeccable comedic timing, but it also has well developed characters whose actions always have logical reasons. Even better, they aren’t afraid to point out how wacky things are getting. When Betsy spurns Jack to spend a weekend with Tommy, she does it out of anger for Jack’s continuing hesitance to be married. She also points out to Tommy that this is a “crazy arrangement,” aware of the unusual circumstances she’s experiencing. A troupe of parachuting Elvises, providing more unusual circumstances and a rousing eleven o’clock number. What makes Honeymoon in Vegas even more complex and enjoyable is its awareness of the audience. 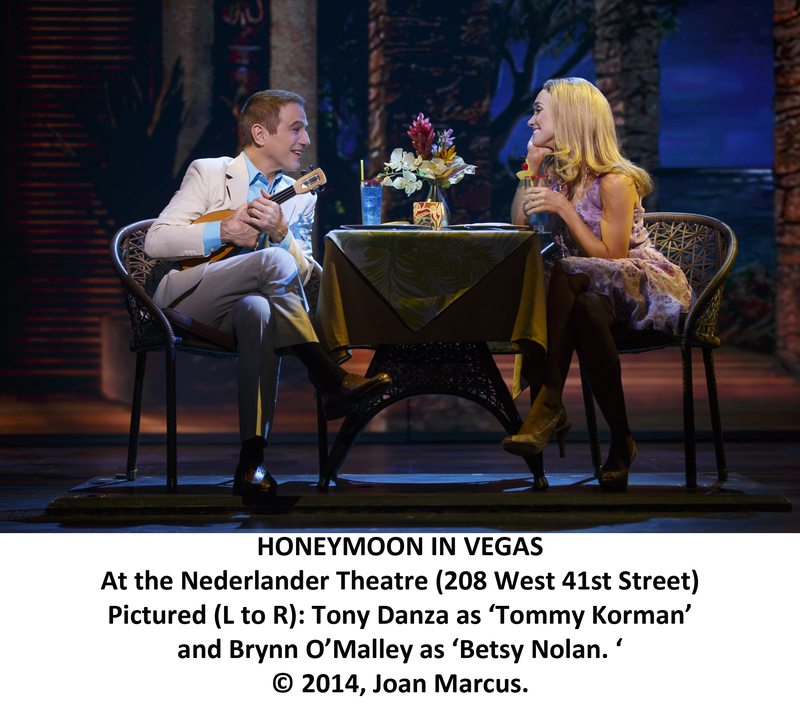 In “I Love Betsy,” Jack sings, “I like Broadway (once a year),” a fun aside for theatergoers. Later in the show, while Tommy is singing and dancing in front of a golden curtain, his henchman (Matthew Saldivar) enters and looks up confusingly at the the glitzy set piece. This doesn’t stop him from joining the number and singing in perfect harmony, though. I mean, who could resist the allure of a musical number? 2) Jason Robert Brown can do commercial oh-so-well. Known for writing heart-wrenching musicals like Parade, The Last Five Years, and most recently The Bridges of Madison County, Jason Robert Brown is the widely known as the musical writer who makes you cry. 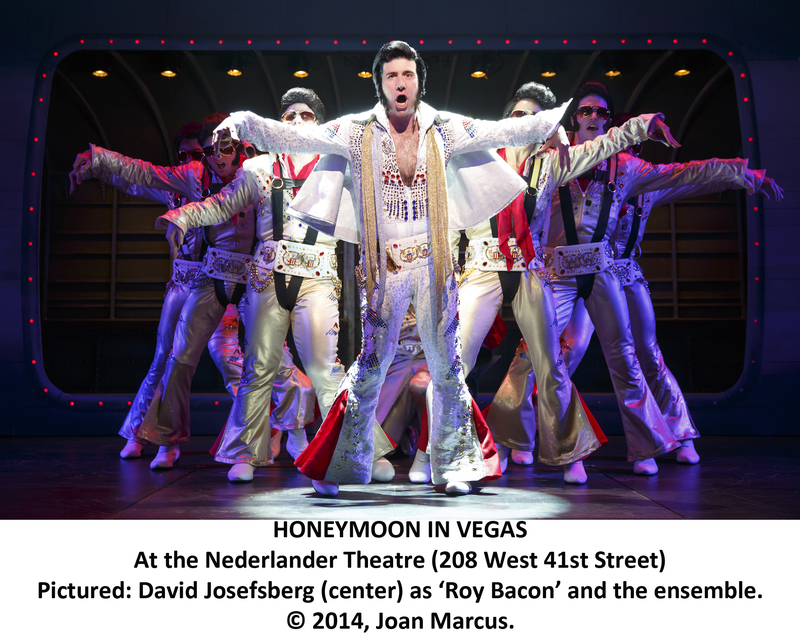 I had wondered how Jason Robert Brown was going to handle the music and lyrics to Honeymoon in Vegas, a story that doesn’t resemble his usual work. As it turns out, he’s ace at it, from catchy up-tempo numbers like “I Love Betsy” and “Friki-Friki” to sweeter fare like “You Made the Wait Worthwhile.” There’s even a “classic” JRB song in the mix (and of course, it’s my favorite): “Anywhere But Here,” Betsy’s soaring solo where she needs more from her relationship with Jack. Honeymoon in Vegas has one of the best original scores Broadway has seen in a long time, and I look forward to seeing what else Jason Robert Brown has up his composer and lyricist sleeves. 3) Tony Danza and the cast are incredibly charming. And Tony Danza, the celebrity in our Broadway production equation, is a perfect addition to the show. He can sing. He can act. He also wows the audience in a tap number, and delights them when playing the ukelele. While he does it all, it’s with a knowing smile, the consummate showman throughout his performance. Tony Danza, being charming as hell. So if you haven’t seen Honeymoon in Vegas, you totally should. Broadway’s made a gamble that might just pay off.